If you haven't heard last week Ashley Madison, a website which promotes affairs for married people, was hacked and the identifying information of it’s 37 million members stolen. The group who stole the information has threatened to publish the membership list if the website doesn’t shut down. To date only two names have been released, but I can't help but imagine that there are millions of very anxious people who have availed themselves of Ashley Madison’s services. The impact of this event differs from the typical circumstance where personal information is stolen. The difference is in the victim. The victim isn't Ashley Madison or those who had their personal information stolen, the true victims will be those who were betrayed and had no idea what their mate was doing. If that membership list is published the emotional devastation experienced by millions of spouses will be unimaginable. Being that there is a possibility that the names of present and former members of Ashley Madison will be released come clean about your involvement before the information goes public. It doesn’t change what you’ve done, but it shows that you can take personal responsibility and face what you’ve done rather always having to be caught. 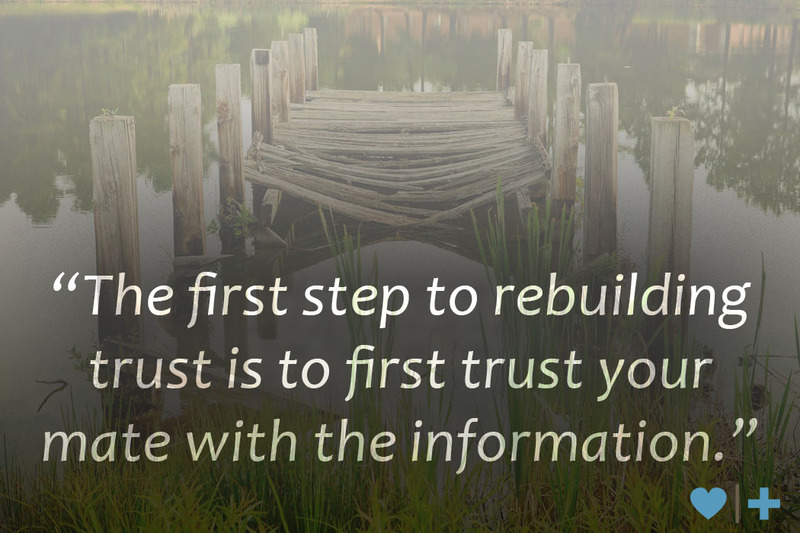 The first step to rebuilding trust is to first trust your mate with the information. The fact that you speak to them before you absolutely have to at least lets them know that you care enough about them to come forward. More damage is done by the deception than by the sexual acts. It’s the deception that creates the sense of betrayal. If you're asking yourself the question why should I tell, I'd suggest you read the article do I tell or not. Hopefully it will help you see the wisdom in volunteering the information rather than being caught. This may seem a bit redundant, it’s not. Rigorous honesty is sharing the details you don’t want to share. It’s bringing to light the pieces you swore you’d take to the grave. You can never be loved unconditionally if you only let others know who you are conditionally. To begin, be rigorously honest with yourself. If you can’t accept where you’re at, you’ll never get to where you want to go. Review the patterns of your life. You may find you’ve been singing the same song over and over again. If good intentions haven’t created change in the past, they won’t work as you go forward. Accept the fact that you may need something new to change direction. Bad marriages don’t cause infidelity, bad choices do. What is it about you that caused you to make those choices? How did you justify your actions? Discovery isn’t just for your mate, it’s also for you. After this, be rigorously honest with your mate. Any deception will destroy their ability to trust. According to Peggy Vaughan, 72% of people recuperate from what their mate did sexually before they are able to recover from the deception. It’s the deception which destroys their ability to trust after the affair. Don’t extend the journey by continuing to lie. Remember: you’re only as sick as your secrets. The parts of the story that remain untold are the places where the devil has a stronghold. If you’ve spent your life trying not to disappoint others it will be difficult to let others know who you really are, but this is your best shot at being known. Be honest. Regardless of how they respond, you can at least know you’re no longer robbing them of the right to make their own decision. It’s impossible for your mate to redevelop trust for you if you don’t first trust them with information. Not only can your spouse not trust you, but they can’t trust reality or their intuition. Answer their questions. It’s the only way to help them find what’s real. Infidelity is the keeping of secrets and continued deception blocks any hope of healing. Let them know you will answer all their questions, but ask them to be careful about the questions they ask. Suggest that they read the article Advice for Hurt Spouses. Bottom line, research supports answering your mate’s questions. When you trust them with the information they can begin understanding what happened and move on to grieving the loss. Our advice for the injured spouse is that they avoid asking questions that compare your marriage to what you did with your affair partner, or compare themselves against the affair partner. If they ask these types of questions tell them you will give them the answer, but you’d like them to think about it for 24 hours to decide if that’s information they really want. Seek first to understand before seeking to be understood. Defensiveness is nothing more than pride. It is manipulating and controlling how others see you. Even if you are thinking about others, your primary concern is how others view you, so it is still 100% totally self-centered. Rather than being concerned about how others see you, try to understand their perspective. If they feel you’re interested in their perspective, rather than defending your own, they will be far more likely to return the favor. In the long run, all defensiveness accomplishes is creating more distance between you and your mate. Healing after an affair means walking in their shoes. Remember: discovery isn’t just for your mate, it’s also for you. Until you can communicate to your mate that you “get” what you’ve done to him or her, it’s impossible for them to feel that they matter to you. Use this time to listen to your mate. If what they say is false then discard it. If it’s true then let yourself feel the weight of it. If you don’t know then at least agree to ponder it and consider whether it may be true. At the very least try to understand what your actions cost your mate. If you created this mess, why wouldn’t you do what you can to help them heal? Part of their healing after an affair is simply answering their questions. Let them know, daily, that you appreciate that they are still with you and working through this process. A big piece of surviving infidelity is selflessly helping your mate. The trauma created by your betrayal may create emotional flooding. Try to get your mate to agree to a ‘time out’ protocol where either of you can ask for a 30 minute time out to let things cool down. It’s impossible to be rational when we flood emotionally. Rather than letting emotions and actions get out of control and make things worse, agree to take a break to protect your relationship. Your mate seeing you taking responsibility for your own healing after the affair will facilitate discovery. It is difficult for your mate to ask you questions if they fear pushing you back to an old lifestyle. On the other hand, if they see you getting help apart from them, it will make it safe enough for them to risk asking the hard questions. It will also provide you with support as you walk through the emotional instability created by discovery. I believe God gives us all the grace we need to handle any circumstance in the moment, but if we leave the present and begin imagining future situations before they occur, we will experience fear. If we leave the present moment and begin thinking about past events, we will most likely experience pain and anger. The only place where you can be safe from unfounded emotions will be in the moment. Work on mindfulness and staying present in the moment. Ruminating about what's happening with this situation only makes things worse. After you finish reading this article I strongly suggest you shift your focus and begin thinking about other things during the day. Each time you catch yourself beginning to think about past betrayals or the potential future betrayals capture those thoughts and begin to think about things that are life-giving and beautiful. You might find it useful to keep a gratitude journal where you stay focused on what you're thankful for rather than what you fear. Those of you who have already recovered from a betrayal know there is hope. All I can do for those of you who fear what might happen is promise you there is hope. You can never tell the end of the story by the beginning. Sadly my husband was a frequent user of AM and other websites for married men. He did in fact meet several women and established an emotional affair with one. It's been 9 months since DD. I was clueless about such a site and sadly, it's nearly torn our marriage apart. This was not the only behavior he participated in, but it was the one that he kept hidden for a very long time with a variety of email addreses and track phones. The news is breaking every other minute with the latest hack. He did have to enter credit card information to shut his account down. Now, that's in the record along with any other stuff they have. He said he used anonymous names, no pics, and didn't pay with our cc. But, who knows...I'm a basket case most of the time fearing someone will discover his name. I could get into investigating it, but I'm afraid my heart and soul would be too broken. I know enough of what I need to be devastated beyond words...and for his legacy and our future to be tainted, perhaps for the rest of our lives. My husband was on this site as well as many others. Craigslist an such. He frequented those sites. It's ruined my self esteem as well as the parts that make up my very being. My trust in him is gone as well as my respect for him. Our oldest son was witness to these raunchy emails. He has lost all respect for his dad. I thought my husband was my rock my protector the love of my life. I was wrong. It means to me that 27 years has all been a lie. It's been over a year an I still haven't healed or came to grips with it.